Orange peel, hibiscus flowers, cinnamon, roasted chicory root, natural flavor, cloves, licorice root, soy lecithin. Contains: Soy. 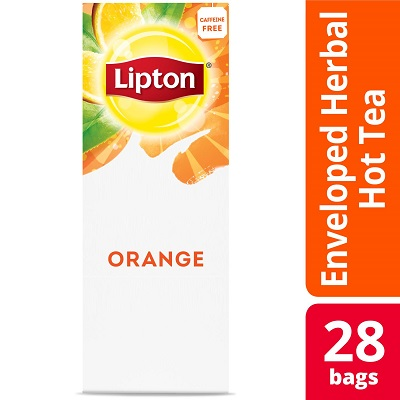 Help keep your employees happy and motivated with Lipton Enveloped Orange Hot Tea Bags. With its distinctive herbal blend of orange peel, cinnamon, chicory, and cloves, this orange tea refreshes and awakens the senses in the morning or afternoon. These hot tea bags offer an ideal means of keeping employees satisfied and stimulating meaningful connections in the workplace. And thanks to their easy-to-steep design, they allow your colleagues to brew a cup of tea whenever they want. Lipton teas cater perfectly to your employees’ moods and preferences--even as they change throughout the day. Select from a broad offering of delicious office teas to help foster a happier and healthier work environment. A distinctive herbal blend of orange peel, cinnamon, chicory and clove. This unforgettable taste sensation of fruit and light spices complemented by an alluring fresh orange aroma will make this tea a cherished favorite. Tea is one of the most widely consumed beverages in the world. It is soothing, relaxing, refreshing, thirst quenching, invigorating and healthy. Brewed tea contains no fat, salt or carbonation. Feel good choosing a tea from a company that is committed to maintaining the goodness of tea.